Home » Articles » Things To Do » Quad Cities Comic Con Returns! Bigger and better than ever, Quad Cities Comic Con returns! 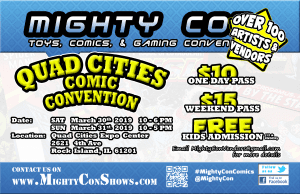 With more vendors, artists and guests than ever, Mighty Con will take over the QCCA Expo Center (2621 4th Ave Rock Island) this Saturday Mar 30 from 10 a.m. – 6 p.m. and Sunday Mar 31 from 10 a.m. – 5 p.m.
Don’t miss the amazing costume contests, either! Individual contests will be held for kids, teens and adults. For more information, visit the Facebook event page at https://www.facebook.com/events/1104074966441800/. Make plans to attend the Quad Cities’ largest comic book and pop culture event!